Underground facilities may someday play a greater role in Naval operations because of future developments such as. Improving effectiveness of satellite surveillance systems which could clearly require the subsurface deployment of' any system this nation desired to keep a secret. The emergence, because of' its continuing invulnerability of the sea-based strategic missile system as our first line of deterrence against nuclear attack; and the importance of protecting its supportive basing and communication system, which may dictate the need for underground or undersea emplacement of key supporting elements of this force. The increasing vulnerability of surface fleets which could lead to the need for an all-submarine Navy, including cargo and troop transport vessels, supported by undersea ports. There you have it, the authors envision a submarine Navy, replete with "undersea ports" and "undersea emplacement of key supporting elements." This report appeared in 1972, the very year the secretive Glomar Explorer set sail. If the Pentagon has built "undersea ports" or manned facilities beneath the sea floor along the North American continental shelf or well out to sea, perhaps even in other regions of the world, it has done so clandestinely. I would caution that the absence of public evidence for such projects says absolutely nothing at all about whether they exist or not. in a dual system such as exists in today's United States with a purportedly open, allegedly constitutional government side-by-side with a parallel clandestine, "invisible" or "shadow" government that is hugely funded by the black budget, quite a lot is possible. Remember that tens of billions of dollars are available in the Pentagon's and intelligence agencies' so-called black budget each year. 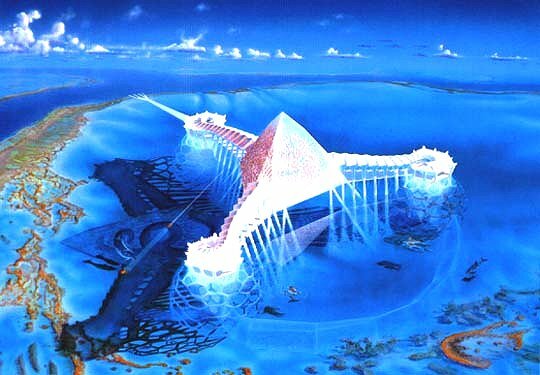 Considering the entire body of evidence, I think it is possible that highly secret, clandestine facilities beneath the ocean floor have been constructed by the American military-industrial complex. I want to say something about the many submarine UFOs that have been seen over the years. Going back for decades, UFO witnesses have seen unexplained objects leaving and entering the world's oceans, seas, bays, rivers and lakes. In recent years, submarine UFO activity has been observed in the coastal waters off Puerto Rico and Iceland. And in late 1999 1 spoke with the host of a radio show in the Midwestern region of the United States who told me of recent sightings of UFOs seen entering and leaving the waters of Lake Erie. In light of observations such as these, I hypothesize that at least some of the observed submarine UFO activity could be related to clandestine sub-sea (or sub-lacustrine) bases made by terrestrial humans. This is a possibility that I believe researchers should consider when carrying out their investigations. Just because a phenomenon, or suite of related phenomena, are highly strange or bizarre, does not mean of itself that they must necessarily be alien, or extraterrestrial. Indeed, from published accounts in the popular aerospace press of recent years, it is clear that the American military-industrial complex has covertly developed a new generation of technology that has been carefully kept out of the public eye. In my view, it is possible that some of the objects witnesses have seen coming and going from the ocean depths may be a new generation of technology secretly developed and funded, and deployed from secret facilities and installations, some of which may be highly clandestine facilities buried beneath the ocean floor or beneath other bodies of water. I cannot prove this hypothesis, but the evidence I have uncovered logically leads me to raise the issue for further discussion and investigation.